O-rings are the most widely used seal in history because of its simplicity, low cost, ease of installation and small space requirements. O-rings are designed for both static and dynamic applications. A properly designed O-ring groove allows the O-ring to be squeezed diametrically out-of-round even before the pressure is applied. The distortion of the O-ring’s resilient elastic compound fills the leakage path, thus, creating a seal. O-rings are primarily used to prevent the loss of a fluid or gas. However, they can be used as dust seals, drive belts or on rotating shafts. 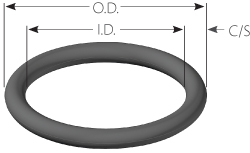 The majority of O-rings can be classified into one of the three arrangements shown below. The O-ring's inside diameter (I.D.) should stretch between 2% and 5% for dynamic applications and between 2% and 8% for static applications. For O-rings with an inside diameter smaller than 20 mm, this is not always possible as it can result in a wider range of stretch. To minimize this range of stretch (including the maximum stretch) it is necessary to minimize the tolerance of the piston gland diameter, and have a less stringent requirement for the minimum O-ring stretch. 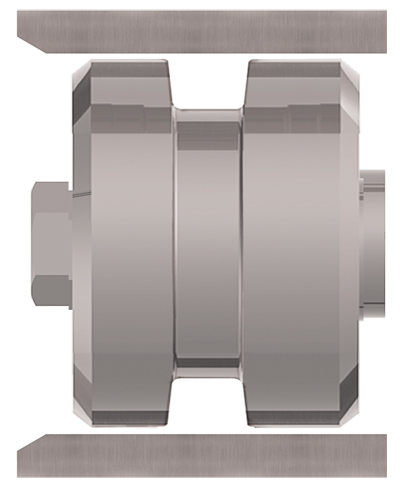 In dynamic applications, it is important to keep the maximum stretch to 5% or less to avoid detrimental effects on sealing performance. The O-ring's outside diameter (O.D.) 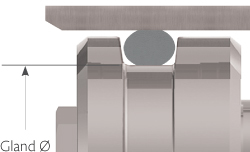 should be at least equal to or larger than the rod gland diameter to give interference on the O-ring's O.D. The O-ring's O.D. 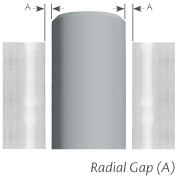 should not exceed 3% of the rod gland diameter for O-rings with an I.D. greater than 250 mm, or 5% for O-rings with an I.D. smaller than 250 mm. For O-rings with an I.D. smaller than 20 mm, this is not always possible due to tolerance issues, which can result in a greater O-ring O.D. interference. If the I.D. 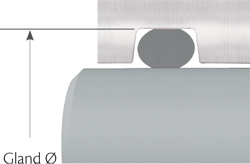 of the O-ring is stretched, the cross-section of the O-ring will decrease. The following table gives the O-ring cross-sections that result from various percentages of I.D. stretch. The difference between the original O-ring cross-section and the final O-ring cross-section once installed is known as the compression squeeze. The gland fill is the percentage of the gland that is occupied by the O-ring. It is calculated by dividing the cross-sectional area (CSA) of the O-ring by the cross-sectional area of the gland. * Effect of gland angle and extrusion gap not addressed. It is important to consider the groove fill of the installed O-ring to avoid detrimental effects on radial sealing performance. 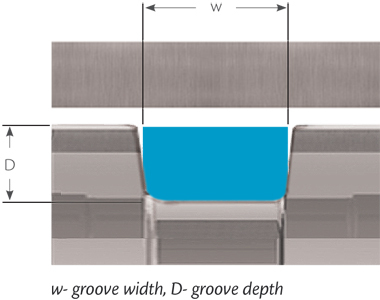 Groove fill of the installed O-ring should not be more than 85 % to allow for possible O-ring thermal expansion, volume swell due to fluid exposure and effects of tolerances. Volume change is the increase or decrease of the volume of an elastomer after it has been in contact with a fluid, and is measured in percent (%). For static O-ring applications volume swell up to 30 % can usually be tolerated. 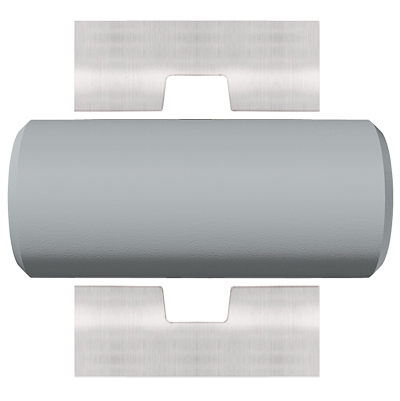 For dynamic applications, 10 or 15 % volume swell is a reasonable maximum, unless special provisions are made to the gland design. This is a general rule and there may occasionally be exceptions. It is important to note that there are significant differences in the coefficients of thermal expansion between the O-ring material and the groove materials. Elastomers can have coefficients of thermal expansion 7 to 20 times higher than that of metals, such as steel. 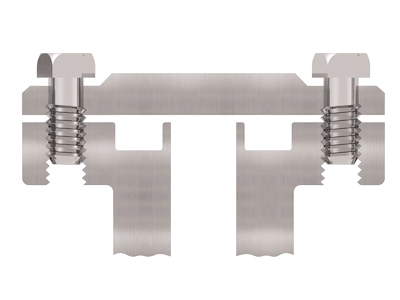 Extrusion is a concern for radial seals where there is gap between the piston and the bore or between the rod and the bore. However, it is not typically a concern for face type seals as the metal parts to be sealed are in contact, line-to-line. The concern with extrusion is that at a higher pressure (especially with soft elastomer O-rings), the O-ring can be forced into the small gap between the piston or rod, and the bore. 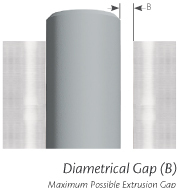 Unless the bore and the piston or rod remain concentric by the hardware, this can cause the entire gap to shift to one side, creating a diametrical gap (see diagram below). There are different methods to counter O-ring extrusion. One of these methods is to simply increase the durometer rating of the O-ring. However, as you increase the durometer, the O-ring can become less malleable. Another option would be to use an anti-extrusion device. 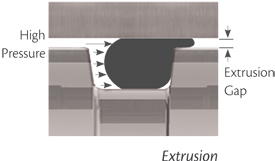 Anti-Extrusion devices ares thin rings made of hard plastic materials such as PTFE, Nylon, and PEEK. Once in place these rings will provide essentially zero clearance. 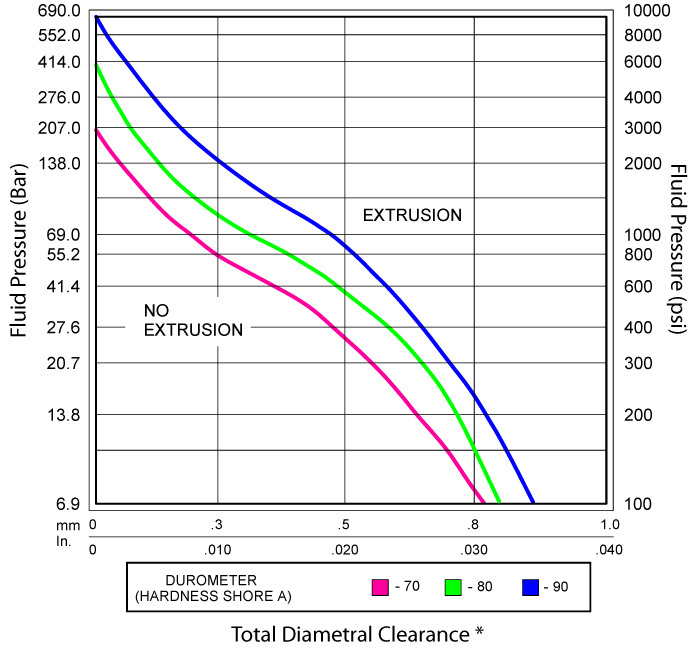 Reduce the clearance shown by 60% when using silicone or fluorosilicone elastomers.